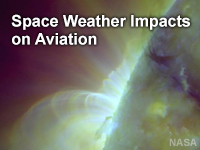 Space Weather Impacts on Aviation examines the effects of solar flares, coronal mass ejections, and other solar phenomena on aviation operations. The lesson builds on background science knowledge taught in the course prerequisite, Space Weather Basics, 2nd Edition. The content gives aviation forecasters and others an overview of the information and products available from NOAA's Space Weather Prediction Center and provides practice interpreting and using those products for decision support during space weather events. Very interesting field of study. This is an exciting and fun module to do. The material is presented in general terms and is not overly technical. The illustrations and graphics are outstanding. The quiz covers the main points with no tricky questions. September 2016: HTML framework updated to latest cross-browser compatibility standards.